OpenLDAP Software is a free, open source implementation of the Lightweight Directory Access Protocol (LDAP) developed by the OpenLDAP Project. It is released under its own BSD-style license called the OpenLDAP Public License. LDAP is a platform-independent protocol. Several common Linux distributions include OpenLDAP Software for LDAP support. Lightweight Directory Access Protocol (LDAP) is an application protocol for accessing and maintaining distributed directory information services over an Internet Protocol (IP) network. Directory services may provide any organized set of records, often with a hierarchical structure, such as a corporate email directory. Similarly, a telephone directory is a list of subscribers with an address and a phone number. A client starts an LDAP session by connecting to an LDAP server(SLAPD -Stand-alone LDAP Daemon), called a Directory System Agent (DSA), by default on TCP port 389. The client then sends an operation request to the server, and the server sends responses in return. With some exceptions, the client does not need to wait for a response before sending the next request, and the server may send the responses in any order. I am working on client system now, so I had used ssh to remotely access the system. 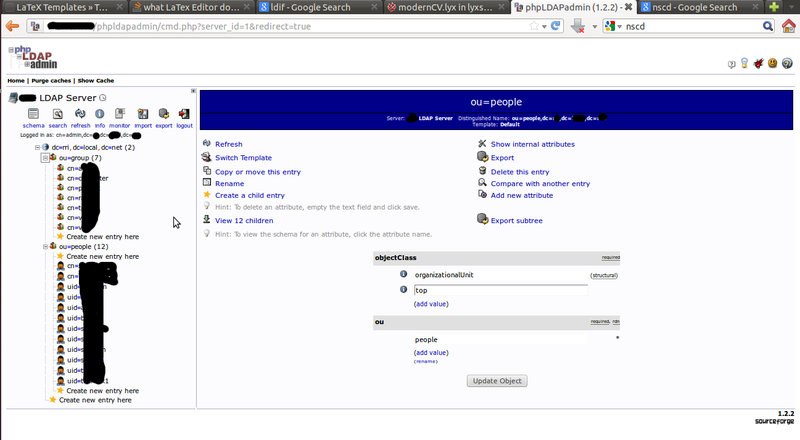 Now in that system we have to deploy the OpenLDAP server. Berkeley Database: In ubuntu default configuration, OpenLDAP stores the directory inside a BDB database. OpenSSL Libraries: These provide SSL and TLS security. Cyrus SASL Library: This provide support for secure SASL authentication. Perl programming language: This can provide custom back-end scripting. iODBC database connectivity layer: OpenLDAP can store the directory in a relational database(RDBMS). The iODBC library is used to connect to RDBMS. After installation finalizes we can now see the location of installed files which we had mentioned in the “--prefix=”, during ./configure. Before getting started with configuring OpenLDAP servers lets make SSL/TLS certificate, which are used for the connection security. If you don't want any encryption then you can skip this task. 1. Run CA.pl as the root user. 2.The new private key is password protected, which means you have to re-enter the pass phrase every time you start OpenLDAP. That’s going to cause problems if you want to have OpenLDAP automatically start when the system is booted (or if you don’t want to remember yet another password). Strip out the password using the openssl command line tool. URI ldap://ldapserver // you can specify the IP of the server too.. Note: slapadd requires directory to be taken off-line. Enter the values as entered into the ldif file, don't break the formatting rules. Our master server has started and its working quiet well. Now its time to configure the client or slave server.